Making the most of autumn’s bounty, we have a selection of jellies and jams available including Quince Jelly, Sloe Jelly, Apple, Cider & Sage Jelly and Damson Jam. These can be purchased from our stand at The Wood Fair at Ickworth House, Park and Gardens on Sunday 9th October. Spring is here and we have just cut the first of the rhubarb. I have made a delicious jam with shredded root ginger. Fabulous with crumpets. Available at Wymondham Farmers’ Market this Saturday in the Market Place from 9am-1pm. 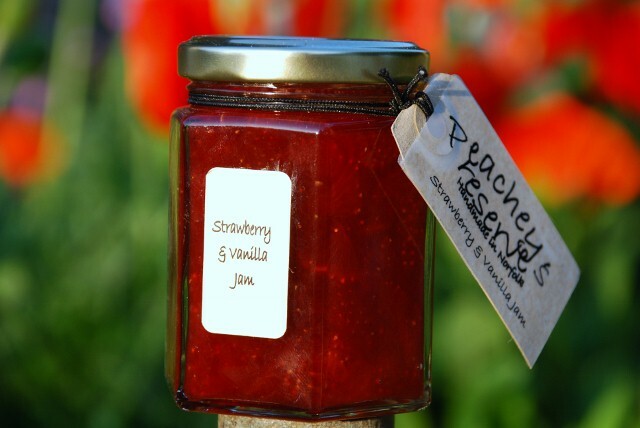 June is the month for strawberries so why not enjoy a cream tea with our delicious Strawberry & Vanilla Jam. This seasonal chutney is made with Bramley Apples from the orchard and tart cranberries sweetened with sugar, cinnamon and cloves. Perfect with Christmas Roast Turkey Lunch. Our new crab apple and chilli jelly is a tart jelly made with crabapples from an old Victorian kitchen garden and Apache chillis grown in the greenhouse by my mum. Medium heat. Delicious with chicken.